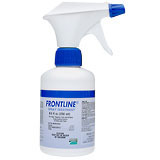 Frontline Spray Treatment provides fast acting, effective flea and tick control for adult dogs and cats and for puppies and kittens 8 weeks of age or older. It is effective against all stages of the brown dog tick, the American dog tick, lone star tick and deer ticks (the major carrier of Lyme disease). It is also used to kill fleas.